Soledad O'Brien will be live from Newtown, Connecticut, with advice and insight from Deepak Chopra and from people who have been through other shootings. Watch Starting Point, live at 6 a.m. ET Monday. [Update 10:27 p.m. ET] Christina Hassinger, 30, the daughter of slain Sandy Hook Elementary Principal Dawn Hochsprung, sent out this tweet after meeting with President Obama before the prayer vigil. [Updated 9:39 p.m.] A long silence followed the conclusion of President Obama's remarks before the audience began to applaud. The president walked off the stage to return to the floor, but a woman stopped him, turned him around and sent him back up the stairs to the stage. He stopped and waved briefly to the still-applauding crowd before exiting backstage. The Rev. Bob Weiss, pastor of Newtown's St. Rose of Lima Roman Catholic Church, then offered a prayer for the community's resilience in the times to come. The Rev. Rob Morris, vicar of King Lutheran Church, gave a benediction before asking the audience to remain in the auditorium, comforting one another, at least until word came that the president had safely exited the school campus. Read the full text of Obama's speech here. [Updated at 9:13 p.m. ET] The president recalled a saying that having children is "like walking around with your heart outside your body" before pausing a moment to wipe a tear from his left eye. "This job of keeping our children safe and teaching them well is something we can only do together," he told the hushed audience. "This is our first task: taking care of our children. It's our first job. If we don't get that right, we don't get anything right." He then asked whether "we as a nation" are meeting that obligation. "The answer is no, and we will have to change," he said. Obama said this was the fourth mass shooting during his presidency, and there were countless other acts of gun violence on a smaller scale. "We can't tolerate this anymore," he said. "These tragedies must end, and to end them we must change." [Updated at 9:02 p.m. ET] Saying "we can't accept events like this as routine," President Barack Obama said Sunday he'll use whatever power he has to prevent more tragedies like what happened Friday in Newtown, Connecticut. "Surely we can do better than this," the president said. [Updated at 8:52 p.m. ET] President Barack Obama is speaking to the crowd, which is remaining almost completely silent. "We gather here in memory of 20 beautiful children and six remarkable adults," he said. "... I come to offer the love and prayers of a nation." He assured the people of Newtown that the entire nation felt the loss. "Our world too has been torn apart. All across this land of ours we have wept with you. We have pulled our children tight. ... Newtown, you are not alone." [Updated at 8:37 p.m. ET] Connecticut Gov. Dannel Malloy spoke briefly, saying "We will get better," before introducing President Barack Obama. [Updated at 8:30 p.m. ET] Newtown First Selectwoman Patricia Llodra said Friday's mass murder was "a defining moment," but it would not itself define Newtown. "We are defined by acts of courage, by love and by our continuing love for our children and families," she said. [Updated at 8:25 p.m. ET] John Woodall, leader of the local Baha'i community, described "a burning grief" that accompanies the loss of a child, a loss that is "beyond the depth of human endurance." However, he said the sacred scripture of the Baha'i faith offers this admonishment: "Be thou not disconsolate. Do not languish. Do not sigh and weep. For agitatation and mourning affect the soul - the divine soul in the eternal realm." Leo McIlrath, ecumenical chaplain of the Lutheran Home of Southbury, Connecticut, offered a prayer for the counselors, clergy and caregivers who are trying to comfort the bereaved. [Updated at 8:16 p.m. ET] A young boy named Jason Graves sang a Muslim chant before Muadh Bhavnagarwala with Newtown's Al Hedaya Islamic Center offered a one-minute homily. "Verily, with every difficulty there is ease," Bhavnagarwala said, quoting from the Quran in a quavering voice. Jane Sibley, minister of visitation and spiritual growth, Newtown United Methodist Church, offered a prayer for first responders. [Updated at 7:58 p.m. ET] Rabbi Shaul Praver, rabbi of Congregation Adathi in Newtown, sang the traditional Hebrew memorial prayer. The Rev. Mel Kawakami, senior minister of Newtown United Methodist Church, stood by his side, wearing a white surplice embroidered with colorful butterflies. "There is no death, just transformation. May they rest in peace," Praver said. Kawakami offered a prayer for the dead and the grieving, "for we are all a family as children of God," he said. "We embrace the grieving as our own. Bring us together in peace and amity." [Updated at 7:49 p.m. ET] President Obama has entered the auditorium to brief, polite applause and quickly taken a seat on the main floor. The Rev. Matt Crebbin, senior minister of the Newtown Congregational Church, is opening the prayer vigil with welcoming remarks. [Updated at 7:30 p.m. ET] Attendees at the prayer vigil rose to give first responders - paramedics, police officers, firefighters and others - a long standing ovation when they entered the auditorium. [Updated at 7:07 p.m. ET] The start of the interfaith prayer vigil is delayed as President Obama continues to meet with first responders and families of victims behind closed doors. Sources at Newtown High School say 900 people are in the auditorium for the service, with 1,300 others in the gymnasium overflow. [Updated at 6:15 p.m. ET] Connecticut's retiring U.S. Sen. Joe Lieberman, Sen. Richard Blumenthal, and Sen.-elect Christopher Murphy are circulating through the Newtown High School Auditorium and speaking with townsfolk assembling there for this evening's prayer vigil. [Updated at 5:47 p.m. ET] President Barack Obama is meeting with the families of victims and with first responders before this evening's prayer vigil at Newtown High School. [Updated at 4:03 p.m. ET] President Barack Obama has just landed in Connecticut where he will meet with family members and first responders. Obama will then attend an interfaith vigil in Newtown, Connecticut. [Updated at 3:47 p.m. ET] Adam Lanza was identified for the first time by Connecticut State Police as the gunman in Friday's shooting at Sandy Hook Elementary School. Lt. J. Paul Vance said that Lanza died as a result of suicide using a handgun. Vance added that Lanza's mother, Nancy Lanza, died as a result of "multiple gunshot wounds" in her home. Vance also told reporters that Adam Lanza used the Bushmaster AR-15 "assault-type weapon" most of the time at the school. Lanza was armed with magazines that held 30 bullets each, according to Vance. He added that there were hundreds of bullets for the other weapons as well. Vance told reporters that an additional weapon, a shotgun, was recovered from a vehicle Lanza parked outside of the school. The gunman also had a Glock 10mm and a Sig Sauer 9mm, multiple magazines and additional ammunition. [Updated at 2:43 p.m. ET] Six-year-old Jessica Rekos was hoping to get cowgirl boots and a cowgirl hat for Christmas. Now her family is left mourning the loss of her young life. "Jessica loved everything about horses. She devoted her free time to watching horse movies, reading horse books, drawing horses, and writing stories about horses. We had promised her she could have her very own horse when she turned 10. She asked Santa for new cowgirl boots and a cowgirl hat. She was a creative, beautiful little girl who loved playing with her little brothers, Travis and Shane. She spent time writing in her journals, making up stories, and doing "research" on orca whales – one of her passions after seeing the movie Free Willy last year. She said her dream was to see a real orca. Thankfully her dream was realized in October when she went to SeaWorld. Jessica was our first born. She started our family, and she was our rock. She had an answer for everything, she didn't miss a trick, and she outsmarted us every time. We called her our little CEO for the way she carefully thought out and planned everything. We can not imagine our life without her. We are mourning her loss, sharing our beautiful memories we have of her, and trying to help her brother Travis understand why he can't play with his best friend. We are devastated, and our hearts are with the other families who are grieving as we are." You can read more about the rest of the victims in our interactive here, which will be updated as we get more photos and statements from family members. [Updated at 2:13 p.m. ET] Lee Shull doesn’t want to feel helpless anymore. That's why as a parent of a child at Sandy Hook Elementary school he gathered other Newtown, Connecticut, residents together on Sunday for a meeting to try to figure out what happened and how they can ensure it doesn't happen again. The group was seeking to move forward a conversation about gun laws, mental health and the moral fabric of our country in the wake of another deadly shooting. "We’re trying to get the word out to this country that we thought this was a safe community," Shull said. "This can happen anywhere. We need to start here and learn from this event." Shull said his family is feeling the impact of the shooting personally. While he’s never met the gunman, his daughter was in a classroom where children were gunned down. Three other girls who shared a dance studio with his daughter are now dead. [Updated at 1:31 p.m. ET] We've just learned that officials have given the "all-clear" at the St. Rose of Lima Roman Catholic Church in Newtown, Connecticut. The church had been evacuated due to an unspecified threat. [Updated at 1:27 p.m. ET] Authorities evacuated a Catholic church in Newtown, Connecticut, Sunday. It was unclear why the St. Rose of Lima Roman Catholic Church had been evacuated. Witnesses said authorities told them to leave the church premises. A column of armed police officers walked across the church property and entered a building next to the church's parking lot. The church is less than two miles from Sandy Hook Elementary School. [Updated at 1:03 p.m. ET] Lillian Bittman, a former chairwoman of the Newtown Board of Education, struggled to speak about the victims killed at Sandy Hook Elementary school. She knew some of them directly, including Principal Dawn Lafferty Hochsprung, who she helped appoint. “Everyone just feels violated,” she said of the town and the school she had been involved with for over 15 years. "It's unbelievable that this could happen to a little school that had so much joy in it." Bittman said the school had done everything they thought they could to protect the children. And she hopes that out of tragedy, the country can find a way to move forward in a meaningful way. "I need the country and the world to understand that out of this we have to bring good. This was an idyllic setting for children and now children, young children, have died," she told CNN's Don Lemon. "When Columbine happened, our school put in a buzzer system. But this keeps happening." Bittman said that the families of those who were murdered are understandably "a mess" right now. She feels the same. The question now, she said, is whether we can put aside our differences as a country on mental health and gun control issues to make sure something as tragic as this doesn't happen again. "We as a country have to use this to come together and look at all the solutions. What can the world do? Love each other and work together," she said. "Figure this out so no more six-year-olds die or have to watch their teacher die in their classroom." [Updated at 12:12 p.m. 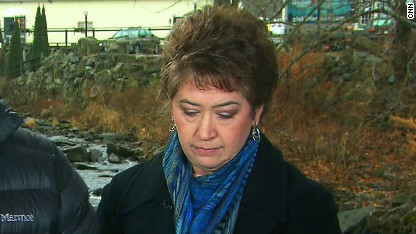 ET] We are learning more details about the victims of the Sandy Hook Elementary School shooting. "Olivia Rose Engel was a precocious and completely endearing six-year old. She loved school, and was very good at math and reading. She was creative, loved craft projects and art class, and loved participating in as many sports and activities as her mom Shannon could get her to- from tennis to swimming, ballet to soccer, Daisy Girl Scouts to musical theater, and her church’s CCD program, nothing was off limits for little girl who’s favorite colors were pink and purple. Olivia was always keen to take a spin on the lake and Sound on her dad or grandpa’s Whaler. She was a patient big sister to three-year old Brayden, lead Grace each evening at the dinner table, and was a six-year old with a lot to look forward to." To learn more about the victims, please look at our interactive, which will be updated as we get more information. [Updated at 12:12 p.m. ET] U.S. Sen. Richard Blumenthal said he has been touched by the "strength and resilience' of the community of Newtown in the wake of the school shooting. "I don’t think I will ever forget the cries of grief and pain that I saw at that firehouse," Blumenthal, a Democrat representing Connecticut said, referring to the area where families gathered to learn if their loved ones were alive or dead. [Updated at 12:02 p.m. ET] Authorities still have many witnesses, including children, that they will interview in the investigation of a Connecticut elementary school shooting, Connecticut State Police Lt. Paul Vance told reporters Sunday. "Our people are talking with everybody slowly but surely, but methodically, too," he said. "This is something where people's hearts are broken, as we all well know. And we have to be sensitive." [Updated at 11:54 a.m. ET] Authorities investigating the Connecticut elementary school shooting are analyzing evidence they've collected, including firearms, Connecticut State Police Lt. Paul Vance told reporters Sunday. "We are tracing them historically to all the way back on the workbench when they were being assembled," he said. [Updated at 11:50 a.m. ET] Inaccurate information about the Connecticut elementary school shooting is spreading on social media, and authorities could prosecute those responsible, Connecticut State Police Lt. Paul Vance told reporters Sunday. 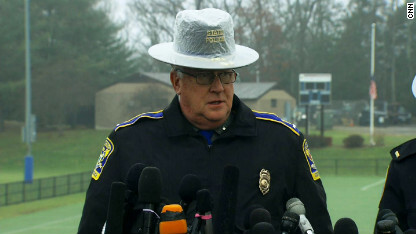 Connecticut State Police Lt. Paul Vance addresses reporters on Sunday morning. "Misinformation is being posted on social media sites," he said. "There has been misinformation from people posing as the shooter in this case, posing using other IDs. Mimicking this crime and crime scene and criminal activity that took place in this community. There's been some things in somewhat of a threatening manner. ... These issues are crimes. They will be investigated. ... Prosecution will take place when people who are perpetrating this information are identified." [Updated at 11:47 a.m. ET] Democratic Sen. Dianne Feinstein of California said Sunday the president will soon have legislation "to lead on" in the gun control debate, announcing she will introduce a bill next month in the Senate to place a ban on assault weapons. "We'll be prepared to go, and I hope the nation will really help," Feinstein said on NBC's "Meet the Press." The senator said she'll introduce the bill when Congress reconvenes in January and the same legislation will also be proposed in the House of Representatives. "We're crafting this one. It's being done with care. It'll be ready on the first day," she said, adding that she'll soon announce the House authors. "It will ban the sale, the transfer, the importation, and the possession. Not retroactively, but prospectively. It will ban the same for big clips, drums or strips of more than 10 bullets," she said. "There will be a bill." [Updated at 9:59 a.m. ET] The gunman used his weapon to force his way into the building, the state's governor told CNN Sunday. "He penetrated the building by literally shooting an entrance into the building. That's what an assault weapon can do for you," Gov. Dan Malloy told CNN's Candy Crowley. Malloy also said he was the one who broke the news to families that their loved ones had died at the school. "It's a very difficult thing to do," he said. "The parents had been gathered for a number of hours, clinging to hope. ...And you can never be prepared for that, to tell 18-20 folks, or actually families, that their loved one would not be returning to them that day or in the future." The Connecticut governor also discussed wanting tougher federal laws. Relatives of the victims will meet with President Barack Obama on Sunday when the president visits. All the victims died from gunshot wounds and were struck multiple times, said H. Wayne Carver II, Connecticut's chief medical examiner. Their deaths were classified as homicides. All 20 of the slain children were either 6 or 7 years old. Investigators have been combing "every crack and crevice" of the school and have found some "very good evidence" there and at suspect Adam Lanza's home, where his mother Nancy was killed. The deadly shooting that shattered this quiet New England town also reignited the ongoing debate about gun laws in America. "Remember the police come only after a crime is committed and then it's too late. People should have the right to own guns to defend themselves. It goes against everything this country was founded on to believe otherwise. If you live in the outback and you got a pack of man eating lions running around you don't disarm yourself. You keep your gun loaded and handy so that you can protect your loved ones. The same logic applies here when comes to schools and our kids. The schools should right now appoint two or three people on staff at each school to carry a concealed hand gun. It could be a teacher or even a janitor. Someone good and responsible. That's the quickest way to protect our children from these sickos. The NRA is an INSIDIOUS CANCER that takes a terrible toll on countless innocent victims. The advocates and mongers of these lethal weapons must be effectively treated before the deadly CANCER spreads further. More people are killed by automobile accidents, outlaw cars! Sadly, this is not a gun control issue. That would be so easy. I believe in gay marriage, but I stop there. In fact, I want to get a permit to carry now. Guess what, it is unlikely this will help, nor the gun detectors in schools. Media; people; you must first understand that if a PSYCHOPATH wants to kill a bunch of people; he/she will. Let's start there. Is there genetic predisposition? Are there social and emotional precursors? I can tell you that I know it to be FACT that most PSYCHOPATHS ARE NARCISSISTS. Media? Hello? Are you listening? I read his name. I forgot it. I will never repeat it or his crimes in a public forum. These are criminal investigations. GAG THEM.